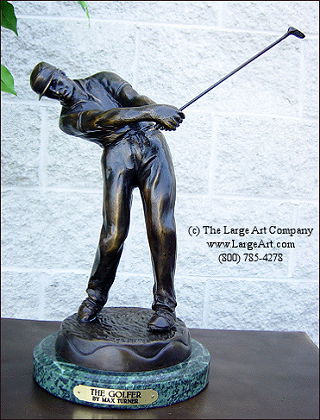 For all you golf players out there we are pleased to present this classic golfer bronze statue. This sculpture was created and signed by Max Turner. If you or someone you know enjoys golf this is an awesome gift! The brass nameplate on the front can be customer engraved with the wording of your choice, which makes this sculpture excellent as a trophy or award. A real classic piece of sculpture cast in pure bronze to last forever! This sculpture measures 14" tall x 8" wide. Click the image above for a pop-up window with several more photos of this sculpture.